In 1929, Bentley motor cars finished in the first four places of the Le Mans 24 hours endurance race. Their cars had maintained their winning streak first gained in 1927, due to an improved cylinder head design for the engine. The innovative design was by Exeter born, Harry Weslake, who in later years would be involved in the design of every Jaguar engine from the first XK100 through to their V12 of the early 1970s, and the success of the engine that would power the Austin Mini. Harry was born in Exeter, on 21st August 1897, into a comfortable middle class family – his father, Henry John Weslake was a director of Willey and Co. He had a brother ten years his senior, and a sister who died before he was born. His maternal grandfather named Lavis had been a boat builder in Exmouth, a name that is still connected with the industry to this day. Harry's first home was Clyde House, Princes Street, St Thomas, an area of comfortable, middle class housing from which, his father could walk to work. The young Harry was sent to Exeter School where he found a liking for sport, rather than study, and he soon learnt that physical fitness was one way of keeping the school bully at bay. As a schoolboy, he acquired a bicycle, but quickly craved after a motor cycle. To this end he designed a system where a motor would drive a third wheel next to the rear wheel on his bicycle, rather like a side-car. His father was not impressed by the design which was not developed; a couple of years later, the Wall Autowheel was marketed, forcing his father to apologise for his lack of faith in Harry's original concept. In 1912, at the age of fifteen, using his pocket money, Harry applied for his first driving licence, and immediately hired a Swiss Motosacoche motorcycle from the St Thomas' Motor Cycle and Cycle Car Garage, Alphington Street, run by Phillip Pike. He was serious about his first motorised venture, acquiring a pair of goggles, and a belted black macintosh, 'de riguer' for a budding speed king. Out on the open road, he was spotted by a friend of his mother, who immediately reported his adventure. The Chief Constable, a family friend, was informed, and soon every constable around Exeter was told to keep a lookout for the speeding Harry. While enjoying his ride through Kenford, Harry was stopped by a policeman with the words, "Be you young master Weslake. Go on home, your mother wants 'ee." He decided to get the best out of a truncated tour by taking the long way home. Near Starcross, the drive belt broke, and having no tools, he was forced to return with the motorcycle by train, and a ticking off, from which he defended himself with some passion. His father had Harry apprenticed to Willey and Co with the aim of progressing through all the departments, learning the ways of the tool room, drawing office, foundry and engineering shop. This was a good training for what would be his future career, but first there was the little matter of getting to work, which for Harry, meant acquiring a motorcycle of his own. His parents must have realised that they could not prevent the lad, and after some pressure, they agreed that he could have a motorcycle. A Rudge Multi, which in 1915 cost £58 15s, was ordered from the Rudge dealer in Sidwell Street – when the mechanic delivered the machine, Harry's mother enquired why was he pushing it and not riding it, to which he replied that it was too fast for him, and that Harry was the only one who could ride it with any skill, having had a test ride earlier. Soon, Harry gained a reputation as a skilled motorcyclist, even having an impromptu race with a local, Reg Holloway, who had competed in the 1913 Senior TT. Harry organised and entered many hill climbs around the Exe Valley and Dartmoor. The Rudge was an ideal machine as it had a multi-gear drive which allowed an almost continuously variable ratio of gearing for selection. However, the difference between the top and bottom gear ratio was not great, so Harry set to work to fit an NSU two-speed gear to the crankshaft, allowing the gear range to be doubled. With this gearing he arranged for a hill climb at Pepperton Lane, Moretonhampstead, one of the more difficult hills in the area. His Rudge sailed up the 1:2.5 gradient and around the two extreme S bends without any difficulty, only to have his pride pricked when the local AA man ascended the same hill, with ease, on his Triumph, a route he often undertook for his work. By this time, Harry Weslake was becoming an expert in the workings of his motorcycle, and was only too aware of its shortcomings. The Rudge had a carburettor known as a Senspray, that injected fuel somewhat like a scent spray – it was a better arrangement than other carburettors, but open for improvement. Using his engineering knowledge from Willeys, Harry improved upon the design, leading to better fuel economy and a joint patent taken out with his father in 1918. At the outbreak of war, the 17 year old Harry tried to enlist with the 7th Devons, but his prior arrangement with Willeys as an apprentice saw him quickly returned to the company. The next year he joined the Royal Flying Corps, and was posted to Hastings as a cadet pilot. The training required attending lectures in the working of the combustion engine, an area in which he was often ahead of his instructors. He so impressed a corporal instructor that he was taken to see the Chief Instructor, Major McClure, who was also impressed enough that he asked Harry to design and build two carburettors for testing on aero-engines. The noise from the testing interrupted a concert in the Sergeants Mess, causing some annoyance – the next day Harry's test engine started before all the others, proving its sound design. Harry was discharged from the RAF in 1919 to return to civilian life. 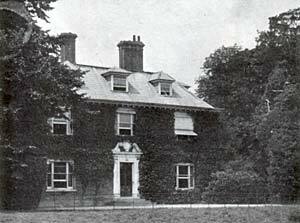 By 1921, the family had moved into Franklyn House, Cowick Lane and soon after his mother died of cancer, followed by his father, also from cancer. Harry started his own engineering company to manufacture his carburettor, with the name of Wex Carburettors. Among his three employees was Stan Glanfield who would attract attention in 1927 by riding around the world on a Rudge motorcycle and side-car. While in Brisbane, Stan saw motorcycles race on cinders, and returned to England with a team of Australian riders to stage the first speedway meet in England, in Epping Forest during February 1928. Glanfield's brother Leonard, was one of the founders of speedway at the County Ground, and the Exeter Falcons. Harry became Captain of the Exeter Motor Cycle Club, organising hill climbs and rallys across Dartmoor. Within the city, each make of motorcycle had its admirers, with owners meeting in various pubs and garages. Those who purchased their motorcycles from Pikes in Alphington Street could often be found in the Plymouth Inn, opposite the garage, sharing information on their machines. Not long after, Harry moved his company to Fulham Road, London where the workforce was expanded to seven. Gordon Cobbold, a young racing motorcyclist, who competed at Brooklands, fitted a Wex carburettor to his Sunbeam motorcycle, and had some success. He persuaded Weslake to sponsor him so he could retain his amateur status, and soon Harry was spending a considerable amount of time at the track. Sunbeam became interested and agreed to joint sponsor Cobbold. The development work for racing encouraged Harry to develop a method of measuring the air flow through a carburettor, based on a system developed by Steven Simpson, who designed the penny in the slot gas meter for Willeys. Simpson would later own Luget the outfitters in Cathedral Yard. In 1926, Jack Cobbold won a Gold Star for lapping Brooklands at 101.76 mph, he achieved the fastest lap at the French Grand Prix in 1927 and broke eight class records at Brooklands. Harry Weslake was fast gaining a reputation for producing fast motorcycles. However, all was not well, and after Wex were not paid, for a large consignment of carburettors, they ceased trading in 1926 due to cash flow problems. Harry was taken on by Automotive Engineering at £500 per annum, on a retainer, and soon after W O Bentley asked to meet him. Bentley had been developing an engine that was giving very poor output, and Harry was asked for his ideas on how to improve it. Airflow tests were made and the power of the engine increased by 50% – Harry was then employed by Bentley, also on a retainer. Development continued on the Bentley engines, and in 1929, Bentley's took the first four places at Le Mans. In the 1930s, Harry Weslake went on to develop engines for Austin, SS Cars, which became Jaguar, and MG, among others. During the war he developed engines for Scammel to be used in trucks and fire pumps, and helped solve problems in engines that powered bombers and tanks. After the war, Harry had a research facility built on land at Rye, in Sussex and named his new venture Weslake and Co, Ltd. He continued his association with Jaguar, working on the XK120 sports car and their successors, as well as the Austin Healey. During the 1950s, Weslake designed engines for the D-type Jaguar that raced in the 1955 Le Mans, coming first and third. Dan Gurney became interested in Harry's racing engine development work, leading to the 1967 V12 Gurney-Weslake GP engine that powered the Anglo American Racers, Eagle GP car. On 12th March 1967, two Eagle T1G's driven by Gurney and Ritchie Ginther won the Race of Champions at Brands Hatch. The same engines powered the Ford GT40 that won at Le Mans Twice, first in 1968 and again in 1969. In 1974 the company turned its attention to developing a British speedway engine to compete against the Czechoslovak Jawa engine. In 1976 Peter Collins won the World Speedway Championship in Katowice, Poland using a Weslake engine, and in 1977, John Louis, the Ipswich captain won the British Championship, with the engine. To turn full circle, in 1978, the Exeter Falcons switched to Weslake designed and powered speedway machines, coming sixth in the season and winning the Gauntlet Spring Gold Cup beating Kings Lynn 88-68 on aggregate in the Final. On the 2nd September 1978, Harry Weslake attended the World Speedway Championship at Wembley. Although a Jawa engined rider won the event, the track record was broken by Michael Lee on a Weslake machine. After the event, Harry Weslake collapsed at a reception and died of a heart attack at the age of 81. 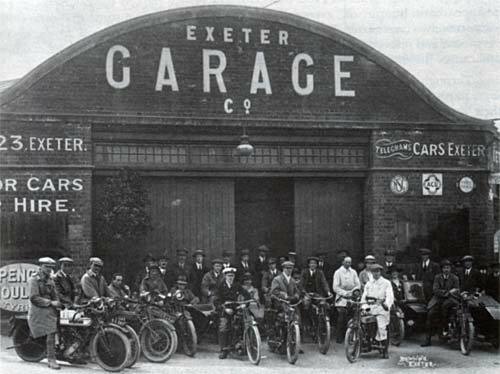 One of Britain's greatest automotive engineers, who for six decades developed motor cycle and car engines, can be remembered as one of Exeter's sons. 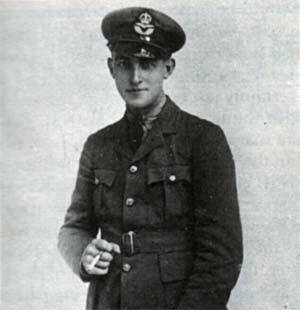 Harry Weslake in his RAF uniform. Harry Weslake was raised in Clyde House. Photo courtesy of Auboné Braddon. 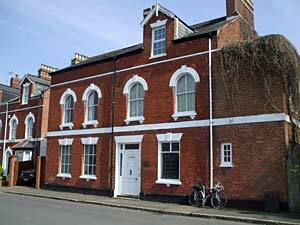 Harry's family moved to Franklyn House in 1921. The Exeter Garage was a popular meeting place for motorcycle enthusiasts. The garage site is now occupied by the Pyramids swimming baths, Heavitree Road. With thanks to Auboné Braddon for drawing my attention to the life of Harry Weslake.